It happens many times some of the iPhone apps we implement to need access to kind of information imported in ways other than the user’s input, or getting data from a file or downloading from the web. A kind of that information is the contacts info existing in the Address Book of the device. Apple allows to access the Address Book database. That happens not directly, but through a couple of provided frameworks. Even though at the bottom line it’s proved easy to fetch contacts info (if you manage to do it once), on the other hand it’s not the most straightforward and the most documented part of the iPhone programming that someone may find. So, in this two-part tutorial, I’ll try to explain in simple words how the whole mechanism works and of course, we’ll implement a demo app. Before we begin programming, we necessarily need to understand a couple of things. Consider this as a theoretical part before going into practice. I’ll try to present it as simple as possible, just to help you get the meaning. Everyone who owns an iPhone uses the Address Book (the Contacts) in a daily basis and in the most of the cases, more than once per day. So, I guess that we’re all familiar with it and we know how it works. That’s important (especially for the user of your app), because whenever our app needs to access the contacts info, the Address Book window is loaded (with limited functionality of course) to allow navigation through the contacts and get all the info we need for the app. That also means that you don’t need to provide a custom interface to allow user to fetch contacts info. It’s provided by the frameworks you’ll use. The first way is to just tap on a contact’s name and then return to your app, bringing with you all the info concerning that contact. When you’re back in your app, you may select what parts of the contact’s info you need. In this point let’s get realists, there is no way you need ALL that info, you’ll pick specific pieces of information only, except if you’re implementing your own address or phone book. 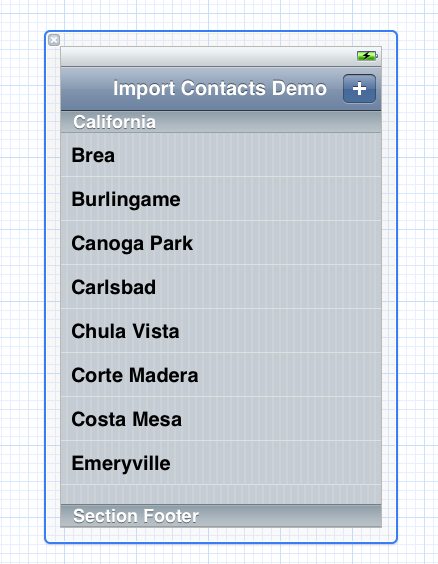 Anyway, use this way only if you want to import into your app more than one pieces of information of a contact. This is what exactly we’ll discuss in this part of the tutorial. The second way is to tap on a contact’s name and then go to a new window, where detailed info is provided. In there, you choose what you need for your app and then go back to it. We’ll discuss this case in the Part 2 of this tutorial. kABStringPropertyType, for properties represented as string values. kABIntegerPropertyType, for properties represented as integer values. kABRealPropertyType, for properties represented as float values. kABDateTimePropertyType, for properties represented as time or date values. One final note. After selecting contacts info to import into your app and processing it, you don’t actually store the properties (their values) directly into variables or arrays. Instead, you copy them into the variables or arrays you want, using specific methods provided by the framework. No need to worry about it, you’ll see all that in action. In my tutorials (as well as this one), I prefer giving practical solutions to programming problems and I don’t want to get you tired with theories. For that reason, I recommend some more reading about that topic to understand even more how all that stuff work. Personally, I recommend the “The iPhone Developer’s Cookbook” by Erica Sadun and the “Address Book Programming Guide for iOS” by Apple. Ready to go to the real work? Let’s create the demo app first. Begin the XCode and create a Single View Application. Click on Next and give a name. I named the app ContactsTestApp. Save it somewhere in your disk and you’re ready. A Navigation Bar at the top. 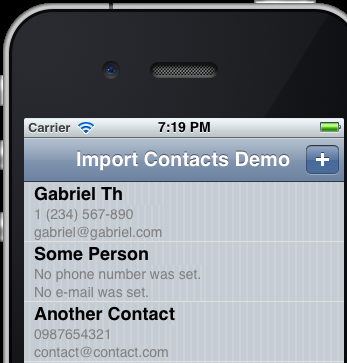 Give the title “Import Contacts Demo”. A Bar Button Item at the right of the navigation bar. You may give it a name, I chose the “Add” Identifier (see the image below). 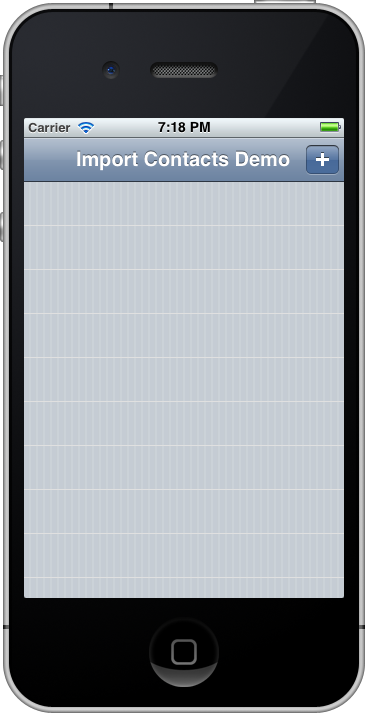 An UITableView (FRAME: X:0 Y:44 W: 320 H: 416). 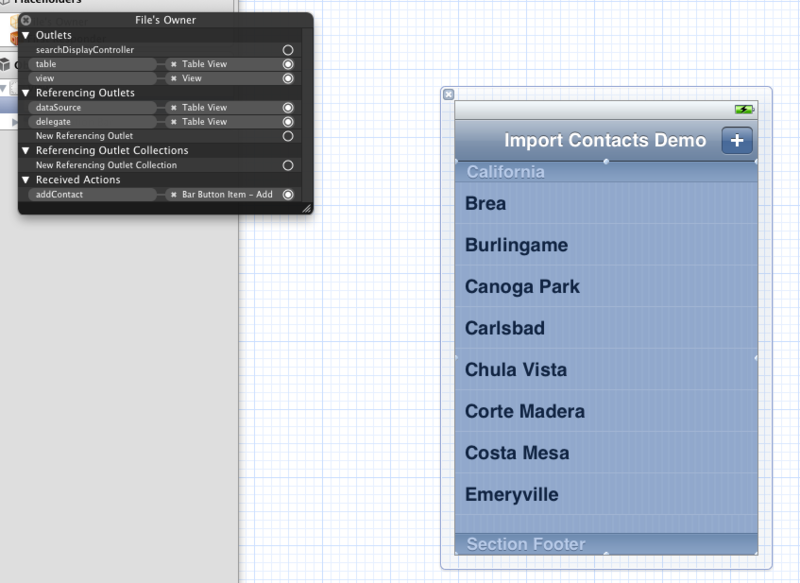 Go to the interface builder and connect the outlet to the table view. 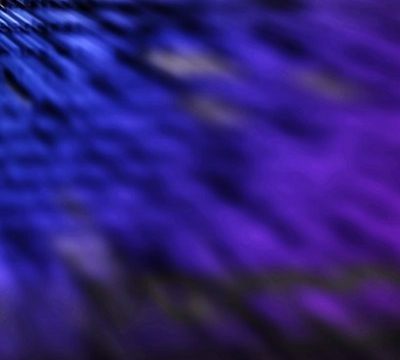 Don’t forget to connect the table’s dataSource and delegate to the File’s owner. Also, connect the IBAction to the bar button item. So far we’re fine. We created and set up our demo app and we’re ready to go to what we’re really interested in. I’m sure you know how to import frameworks into a project. Go and import the above two into this project now (select the target project –> Build Phases –> Link Binary With Libraries –> Click on the plus sign (+) and in the new window that appears search for them). // Import the two next necessary libraries in the ViewController.h file. // The contacts object will allow us to access the device contacts. Until now, we created and setup the demo app, we imported the two necessary frameworks that are required and we also created an object of type ABPeoplePickerNavigationController (this is actually the Address Book modal view that will show up) to access the Address Book. Our next task is to allow the user of our super-app to add contacts into it. So, we’ll implement the IBAction we declared earlier and you connected (I hope you did) to the add button in the Interface Builder. With the above method implemented, every time you tap (or click in the Simulator) on the add button, the Contacts modal view controller will show up, but nothing more yet. Even the Cancel button existing in the Contacts doesn’t work. Let’s work on that on the next step. // Implement this delegate method to make the Cancel button of the Address Book working. 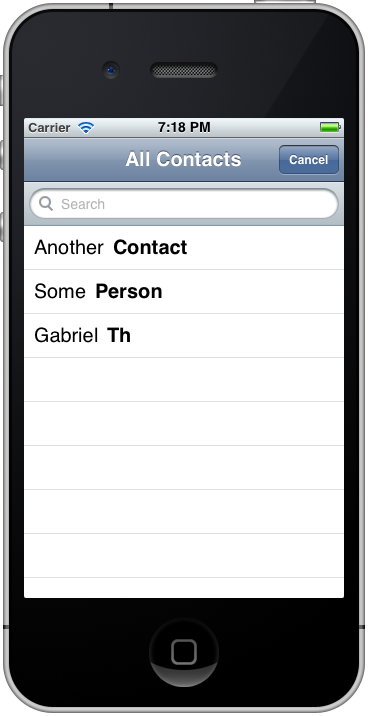 As you can see, the contacts view controller is dismissed and released. With the first two we’ll compose the full name. The next two are multi-values, which mean that they are returned more than one values (multiple phone numbers and multiple e-mails) and for the ease of our example we’ll get only the first values of the returned ones. Once we fetch all the values we want, we’ll create an array with all of them. This array will be added in the contactsArray (the contactsArray is the array that will be used to store the data to be displayed in our table view, see later). This process is going to take place every time the user adds a contact into the app. Add now the next delegate method into the ViewController.m file. The comments in it explain each step. Note that we actually copy the returned contact info into our variables instead of storing them directly. // The phone numbers and the e-mails are contact info that have multiple values. // For that reason we need to get them as arrays and not as single values as we did with the names above. // Watch out the ABMultiValueCopyArrayOfAllValues method that we use to copy the necessary data into our arrays. // Make sure that the selected contact has one phone at least filled in. // We'll use the first phone number only here. // In a real app, it's up to you to play around with the returned values and pick the necessary value. // Do the same for the e-mails. // Make sure that the selected contact has one email at least filled in. // We'll use the first email only here. In the above method, did you see the return NO command at the end? That NO (false) means that the Contacts view controller should not continue into the selected contact’s details and should return in our app. If the method returns YES, then the view controller opens a new window with the contact’s details displayed on-screen. You’ll see this case in the second part of this tutorial. 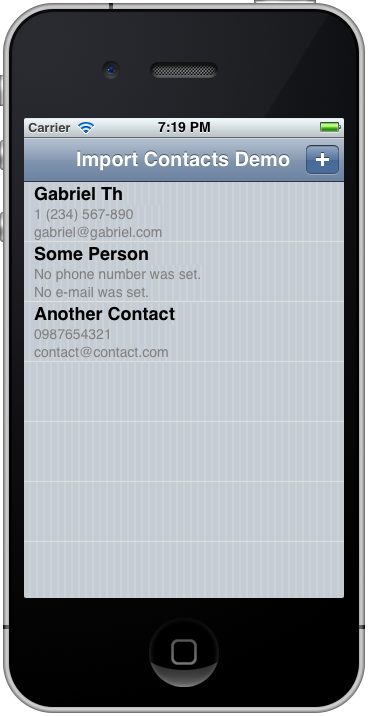 Also note that we manually dismiss the contacts view controller. For the time being everything works fine, but nothing appears on the table view yet. In the next step we make our table view fully working. // in the detailsTextLabel area. // Specify the current row. // Display the selected contact's info. // First the full name, then the phone number and finally the e-mail address. // The rest info will be displayed in the detailsTextLabel of the cell. // Set the total number of lines to two (2). Everything is ready. You may try the app in the Simulator. Below I give some screenshots of our app. I hope this how-to helped you to get the general idea when you want to work with the Address Book. Also, if you wish or if you need to, look at the second part of this tutorial, where we’ll get only a specific value from a contact inside the Address Book.